It’s hard to pinpoint an exact moment when this phenomenon began, but there’s little doubt that 1968 was a watershed year. Two films served as vivid illustrations that things were turning decidedly deadly for black characters. The first, Spider Baby, Or the Maddest Story Ever Told, opens with a cameo by Mantan Moreland, the African-American actor renowned for playing comedic sidekicks in over a dozen thrillers in the 1930s and ’40s. 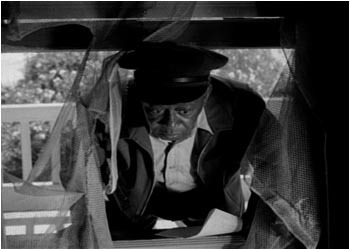 In films like King of the Zombies and the Charlie Chan mysteries, Moreland’s bug-eyed reaction shots and Scooby Doo-like skedaddling earned him crowd-pleasing laughs that ensured his survival, but they also earned him the ire of civil rights groups like the NAACP, who all but ended his career by lobbying for more dignified roles for people of color. In Spider Baby, Moreland, who hadn’t worked steadily for years, appears shockingly old, lethargic and humorless — a shell of his former spry self — but even more shocking, he’s unceremoniously slashed to death in the first few minutes of the film. This opening scene thus served double duty: it marked the literal death of the outdated black “spook” stereotype in horror movies, and it christened a new, more modern stereotype: the black victim. Filmed in 1964 and released half-heartedly four years later, Spider Baby was ahead of its time, predating similarly plotted maniacal family films like The Texas Chainsaw Massacre and The Hills Have Eyes by a decade or more. Along with the splatter work of Herschell Gordon Lewis, it helped usher in a new era of horror movies: ones that were more graphic with a higher body count to satisfy a perceived modern bloodlust. One thing these films needed, though, was victims. Like Spider Baby, 1968’s Night of the Living Dead pushed the boundaries of gore, but it also pushed racial boundaries by casting an African-American man, Duane Jones, in the lead role of Ben. In the film, his character domineers the all-white supporting cast rather than playing second fiddle or comic relief, and is the lone survivor of the zombie onslaught, only to suffer the ironic fate of being shot to death by a rescue party that mistakes him for one of the undead. Even though Ben’s race was not specified when the script was written, the role was a tremendous social leap forward from the likes of Mantan Moreland. Despite this progress, in the end, the black guy still dies, not only reflecting a sense of hopelessness about the modern landscape of the late 1960s, but also launching a legacy of despair about the fate of black characters, even those in starring roles. Up until this time, black roles in horror movies were tangential at best and non-existent at worst. Aside from stereotyped comedic appearances by the likes of Moreland and Willie Best, any roles for black artists were likely anonymous servants or faceless African tribesmen. In the 1950s, the same public pressure that halted Moreland’s career likewise caused many of these parts to disappear, but they were replaced with little or nothing. By the 1970s, however, the success of Blaxploitation films made the inclusion of black faces in mainstream fare all the more palatable and expected. But, while bigger roles meant more screen time, more screen time meant a higher chance of dying. In the wacky world of horror, though, death means inclusion. Especially in today’s modern, blood-splattered cinema, where inventive death scenes are valuable commodities, being killed in a horror movie isn’t the worst fate one can suffer. Being ignored in a horror movie is. Since the ’70s, there’s been little documentation of the phenomenon of black death apart from the occasional punchline. Jamie Kennedy never mentions it amongst his “rules” in Scream (and thus, unprepared, Jada Pinkett and Omar Epps get shanked in the opening minutes of the sequel). Most academic discussions on race in horror movies deal with the portrayals of African-American characters while they’re still alive rather than their inevitable demise. BlackHorrorMovies.com has endeavored to document the phenomenon. Based on a sampling of almost 1,000 horror films containing over 1,500 appearances by black actors and actresses, this site has found their mortality rate to be about 45%. How high this figure sounds depends on your point of view, but given all of the minor, non-speaking roles that were accounted for, saying that nearly one out of every two will die sounds pretty slaughter-ific. Jason Vorhees dispatches another black victim in Friday the 13th Part VII. In particular, in modern horror sub-genres that hinge on gory death scenes — slashers in the mold of Halloween, monster movies like Alien or Jaws and zombie flicks a la Night of the Living Dead — any black characters deemed major enough to have a name and a speaking part are, more often than not, toast. In the archetypical Friday the 13th series, for example, an astounding 16 out of 19 black characters die. Of course, it’s not like horror filmmakers begin shooting with the thought, “He’s black, so he has to die.” But black actors and actresses are nonetheless systematically relegated to supporting roles in the Hollywood system, and in horror movies, supporting roles equate to dying roles. Almost 40 years after Night of the Living Dead, black performers still rarely play the lead in horror movies outside of the all-black “urban horror” sub-genre. It’s a less demeaning form of marginalization than the stereotyped roles of Mantan Moreland and Willie Best, and it’s certainly better than being excluded altogether, but until Hollywood’s casting standards evolve to redefine who is acceptable as a hero or heroine — in the horror genre and beyond — “the black guy” will continue to die along with the nerd, the jock and the slutty cheerleader.